The Collision Industry Foundation is taking donations to assist members of the collision repair industry and their families affected by Hurricane Harvey with replacement tools and basic necessities. “Definitely, we need donations now,” said trustee Jordan Hendler (Washington Metropolitan Auto Body Association). Donate here. Also, don’t forget that the Collision Industry Foundation is on Amazon Smile. If you designate them as your charity and buy stuff on smile.amazon.com instead of the regular Amazon website, the retail giant will donate a little bit to the foundation every time you buy one of millions of designated products. CIF’s mission is to help collision repair professionals affected by catastrophes, particularly those whose livelihood is in jeopardy. “That’s what CIF is all about, helping those within the Collision Industry that have experienced a catastrophic life event,” CIF Chairman Bill Shaw (PPG) said in a January statement following a donation to a West Virginia flood victim. The Society of Collision Repair Specialists on Tuesday urged members to consider donating to the foundation. “If you are interested in contributing to relief, please consider sending your donations to the Collision Industry Foundation (CIF) to help those in the collision industry affected by Hurricane Harvey,” the trade group wrote. The Collision Industry Foundation coordinated roughly $250,000 in donations following Hurricane Katrina in 2005, Hendler said. She estimated CIF helped roughly “around 150 individuals and families in the collision industry” in Louisiana and surrounding states. 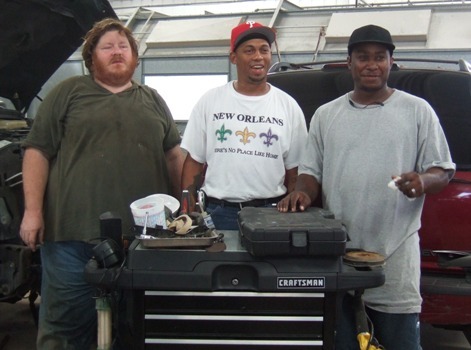 “There was definitely a huge effort after Katrina to retool technicians” and help with basic necessities, Hendler said. CIF issued gift cards to stores like Walmart and Sears so the recipients had flexibility to determine what they needed. “We did tons of Walmart gift cards,” Hendler said. She recalled that CIF gave out at least 84 tool sets — “a rough number,” Hendler said, noting it was likely more. The organization used Sears’ Craftsman equipment simply to get a bigger bang for the buck. Often, tools were more important than necessities, as technicians felt, “‘If I had tools, I could work,'” she recalled. The group takes applications and dispenses donations case-by case. “Anyone in the collision industry” can apply, Hendler said. Call 855-4CIFAID or visit www.collisionindustryfoundation.org/disaster-relief. “We’re mobilizing, trying to understand and assess right now,” Hendler said. Donations are likely the best way for the industry to help out in Texas, but there might be a few other forms of assistance that could be useful, and we’d encourage anyone with other ideas to contact CREF leadership. For example, a local Lowe’s employee helped get a discount and maximize the buying power of CIF’s last publicized donation, $2,573 for the Greenbriar Collision Center employee in West Virginia during severe flooding. 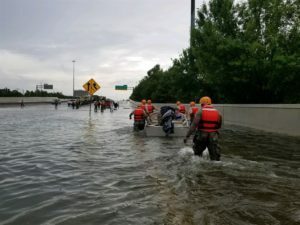 The Auto Body Association of Texas also plans some sort of effort on behalf of those affected by Harvey, but the nature of the disaster makes it hard at this point to determine what is actually needed on the ground in Houston, ABAT Executive Director Jill Tuggle said Tuesday. “We are going to do something,” Tuggle said. She encouraged those wishing to help to contact info@abat.us. The collision repair industry can be extremely generous, and a state trade group half a country and part of an ocean away had already inquired to SCRS about ways to help out in Texas. The eagerness to help sets a good example for the rest of us. “I just hope that we can share a little bit of “Aloha Spirit” and reassure them that they’re not alone, people have them in their hearts and minds, and to stay positive,” Okahara (Oka’s Auto Body) wrote in a separate email to us.